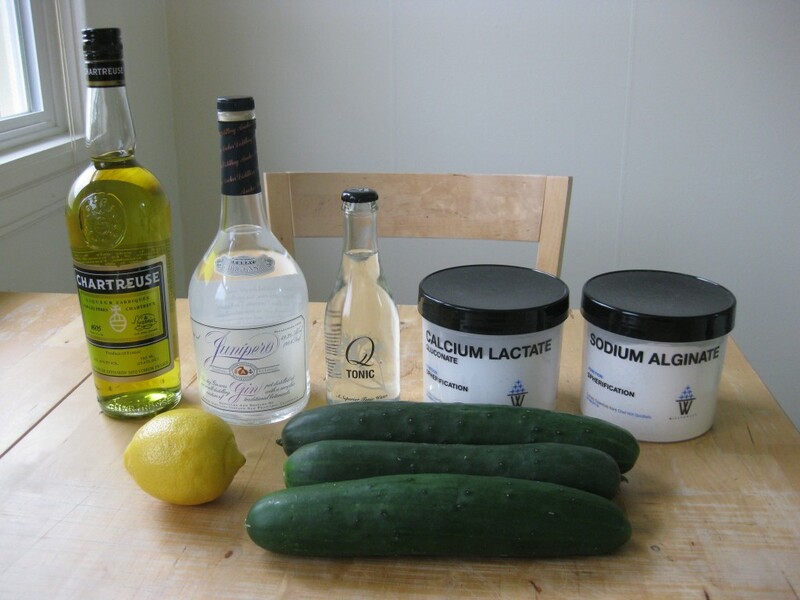 Here’s my attempt to recreate The Aviary‘s gin and tonic with encapsulated cucumber juice. 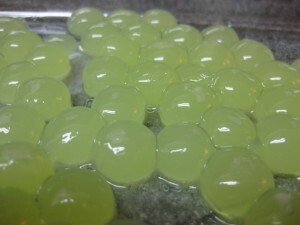 The cucumber juice boba spheres are liquid on the inside and burst in the mouth. The drink is shown in the video below. 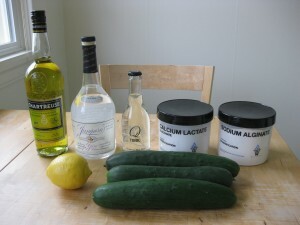 Since the relative quantities of the ingredients weren’t mentioned in the video, I used the recipes for the Cloister and Summer Cup cocktails as reference points because they contain yellow chartreuse. The Aviary’s video was uploaded in 2010. Since then, “popping boba” or “bursting boba” have become popular in bubble tea and frozen yogurt shops. You can buy pre-made bursting boba in standard flavors, but you’ll have to make it yourself if you want a custom flavor like cucumber. Making boba-sized spheres is a challenge. They’re not tiny “caviar” that are easy to mass-produce with a pipette or syringe. They’re not low-production, single-serving, tablespoon-sized spheres typically served as an amuse bouche. Boba-sized spheres need to be mass-produced and large in size, which is why I think Chef Achatz says the labor prevents other people from doing this. Chef Schoettler says there are “96-ish” balls in the cocktail, which I took as a clue to their production methods. This is not some random number; it coincides with a 96-well pipette. Ordinarily, such a pipette can be used to quickly produce caviar 96 drops at a time. For this application, I pipetted all of the liquid out at once in a single impulse to try to make larger spheres. 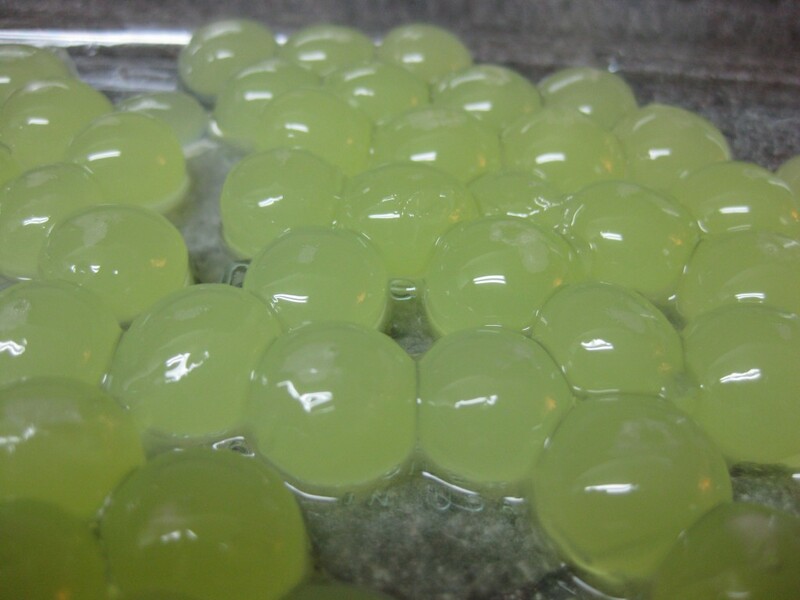 A 30 ml volume of liquid divided across 96 wells should produce boba spheres 0.84 cm in diameter – close to standard tapioca boba balls. Unfortunately, all I got were gel squiggles instead of nice spheres despite trying all combinations of forward and reverse spherification techniques and slow and fast impulse speeds. The pipette tips were too narrow for the liquid to coalesce into a sphere once dispensed and the output gelled in the shape of the stream of liquid. Perhaps The Aviary has a better technique for using the pipette, but I could not figure it out. There was no way I was going to make 96 individual balls with a 0.25 tsp spoon and the spooning technique used for larger balls. That’s way too labor intensive and wouldn’t yield nice uniform spheres in my hands. Instead, I found a mini ice cube tray and used frozen reverse spherification to make the balls. 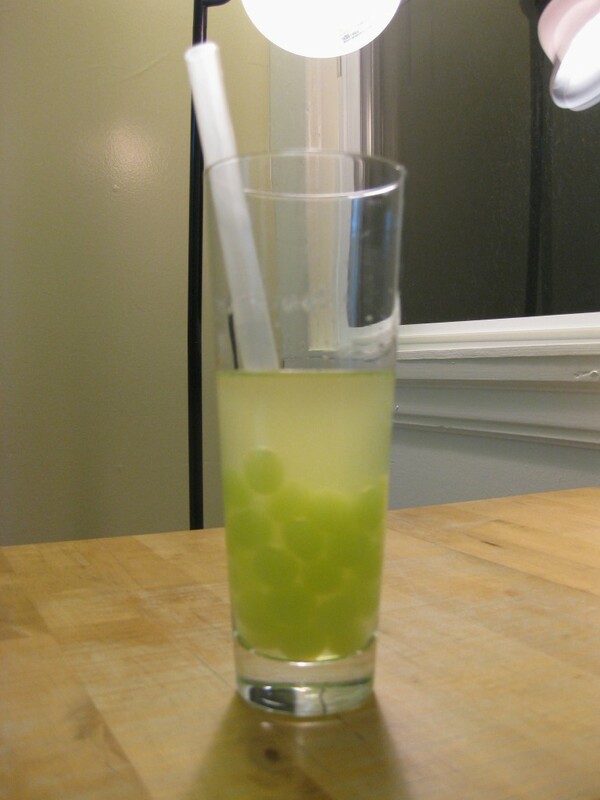 The cubes are 1.1 cm on a side, yielding a sphere slightly larger than normal boba, but still small enough to squeeze through a wide boba straw. Peel the cucumbers, blend in a blender, and then strain the cucumber juice. 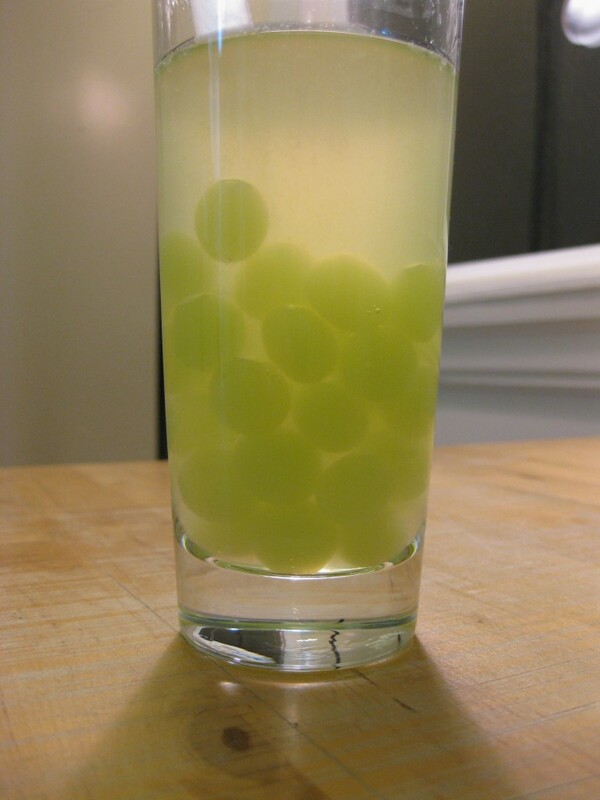 I did not clarify the cucumber juice, as I did with the cucumber soda, because I wanted the nice green color for the balls. Stir in the calcium lactate gluconate. Stir in the sugar. Add a pinch of salt. Pour the juice into the ice molds and freeze in the freezer. 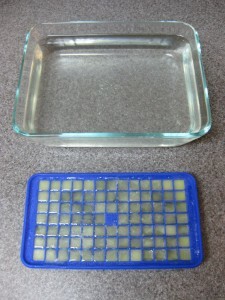 In a separate container, prepare the alginate bath by hydrating the sodium alginate in the water with an immersion blender. 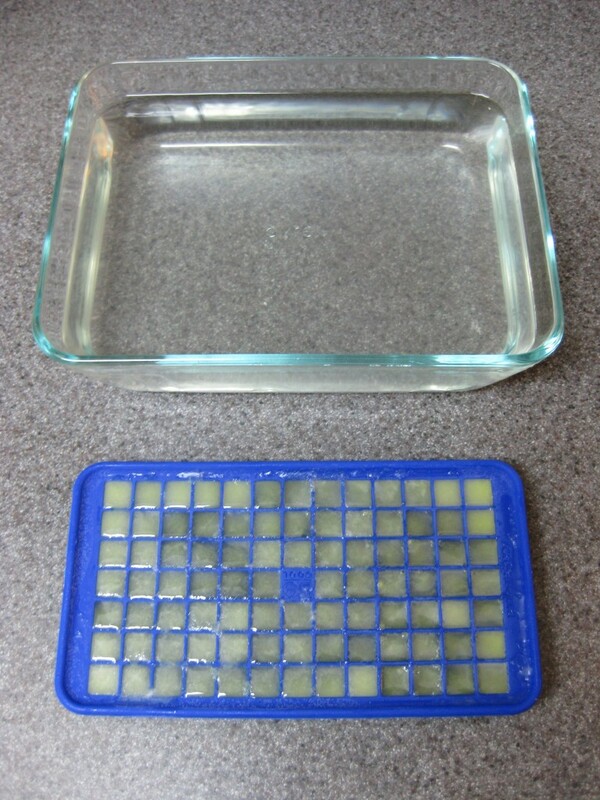 You can place the alginate bath in the refrigerator overnight to let the air bubbles dissipate, but I took a short cut and sealed the alginate mixture in a chamber vacuum sealer. Running the sealed bag through the chamber a couple of times rapidly expands and collapses all of the bubbles, leaving a nice, clear bath. 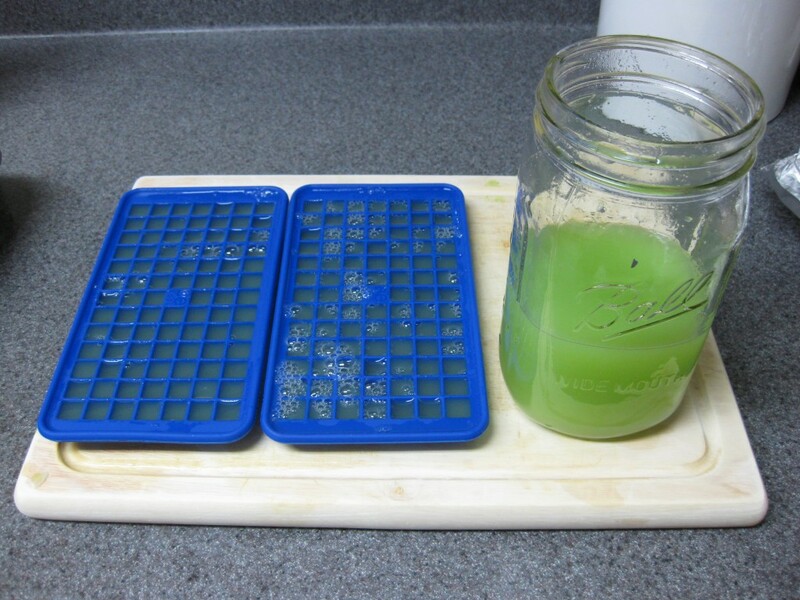 Take the frozen cucumber juice out of the freezer and place each cube into the alginate bath. As the cube melts, the calcium in the liquid reacts with the alginate to form a gel skin around the cube. The cubes will float at first, so you’ll have to push the cubes down into the bath to make sure they’re immersed in the alginate. After a minute or two the balls will sink on their own; that’s when you should remove them from the bath and rinse them with water. They should have a thin skin and still be liquid on the inside. Since this is reverse spherification, the gelling process will stop as soon as the balls are lifted from the alginate bath. To assemble the cocktail, stir the yellow chartreuse, gin, lemon juice, and simple syrup together in a tall glass. Add the tonic water and the boba spheres. I think the drink was missing ice. It wasn’t cold enough. If I made this again, I’d put the gin and yellow chartreuse in the freezer ahead of time so they’re ice cold when mixed into the cocktail. Or I’d shake over ice instead of stirring directly in the glass as the instructions say. Chilling the tonic water wasn’t enough. The ice would also dilute the drink. The gin overpowers everything else as it’s presently mixed. I couldn’t pick out the yellow chartreuse, cucumber juice, or quinine flavors, so it needs some water to mellow the gin for my undeveloped palate. That would also help fill the 12 oz glass to the top, so the glass looks more full. I’ve never tried the original, so maybe I’m not the best judge of this drink. Ultimately, the concept is cool and fun. I can turn any drink into a boba drink now. I think an elderflower soda with cucumber spheres would be a very nice non-alcoholic drink.